Article: UTC to Sun Belt? Would ETSU follow? / Article: UTC to Sun Belt? Would ETSU follow? The OVC part of this is just a smoke screen. UTC is trying to move up and I have a feeling ETSU is trying to do the same. RE: Article: UTC to Sun Belt? Would ETSU follow? 7k seat stadium won't work in the Belt. Could an eastern division look like --- App State, Chatt., Coastal, ETSU, Ga Southern, Ga State, Troy? Basketball drives the bus at ETSU. Stay in the SoCon until a better conference opportunity comes along. Unless you want the short drive to New Orleans for the basketball tournament....and BTW screw UTC. Any move on ETSU's end requires doubling the seating capacity, at least. It's coming, articles like this don't just come out, and I'd be willing to bet ETSU/UTC are a package deal. If JMU, EKU, Jacksonville State, and Kennesaw State are serious about moving up, that's six, now all you need is Liberty as an indy and there's seven teams. Now all of a sudden you're awful close to forming a conference. I don't know, I think it's at least 5-7 years before anything crazy happens, and we'll just have to see what the crazy is related to the ESPN bubble finally bursting. I would be very opposed to a move to the Sun Belt. Yes, you get more money from the conference and probably more "money" football games. That is the only advantage. It puts basketball in the same shape as it was in the ASun to the average fan, but so would staying in the depleted SoCon if UTC leaves. We would also have to double the football stadium capacity, which we currently don't have anywhere close to enough fan support to justify any addition. To me, a win-win would be for ETSU and UTC to jointly move to the OVC. (05-08-2017 05:19 PM)etsubuc Wrote: I would be very opposed to a move to the Sun Belt. Yes, you get more money from the conference and probably more "money" football games. That is the only advantage. It puts basketball in the same shape as it was in the ASun to the average fan, but so would staying in the depleted SoCon if UTC leaves. We would also have to double the football stadium capacity, which we currently don't have anywhere close to enough fan support to justify any addition. Or, the SoCon pull a raid. Go get Jacksonville State, Kennesaw State, Tenn Tech, and Eastern Kentucky. If there's a UTC/ETSU collaboration, then ETSU should be the one calling the shots. ETSU is the department in great shape. UTC just had their football coach plucked and attendance is declining. Their basketball coach fell backwards into another job after destroying the team in 2 years. ETSU football is rising and basketball is at the top of the pile. The title of the story is disturbing. "Football attendance decline may lead UTC to look elsewhere"
This is a gamblers mentality. Things are going poorly, so lets double and triple our bets to make it all back up. (05-08-2017 06:34 PM)MercerFan Wrote: If there's a UTC/ETSU collaboration, then ETSU should be the one calling the shots. ETSU is the department in great shape. UTC just had their football coach plucked and attendance is declining. Their basketball coach fell backwards into another job after destroying the team in 2 years. ETSU football is rising and basketball is at the top of the pile. That was my thought exactly. Your attendance is declining so you want to gamble your finances and move to a conference requiring more attendance to make ends meet? This is very reminiscent of our move to the A-sun. Increased travel costs, lack of familiar schools, doubling-down on non-revenue sports all led to huge donation drops. Changing conferences is NOT the answer to UTC's attendance problems. School identity, marketing, and fan engagement are. Just as a side note, what is their tailgating environment like? That seems to have led to a huge improvement in ETSU's image and game day atmosphere. The new logo has also been a help with fan identity and engagement. A Sun Belt conference where ETSU plays Appalachian, Ga. Southern, Chattanooga, Coastal Carolina, and Ga. State every year is going to pique interest. Those are regional schools that are old school rivalries, along with some nice name teams. MTSU didn't have the support either when they moved up, neither did WKU. Both did it anyway and for both it's paid off in spades in just about every possible way. A move to FBS would make sense, it's just going to take a major investment. Problem with the Sun Belt is there's no vacancy. The only hope in any of this is another FBS split that leads to an open transition period for FCS teams to move up, or a universal end to the moratorium on teams moving up without a conference invite. I disagree entirely. Sun Belt TV revenues aren't substantial enough to warrant the move ($100,000 per school per year as things stand) and would stretch the pie thinner if the league added more schools. That doesn't subsidize the substantial budget increase required to go FBS, and if you get lucky and hit a bowl payout, you might get as little as another $100,000 depending on where you finish in the Sun Belt. That's after several years of being a doormat for App State, GASO and probably USA and ULL. If TV revenues dry up (and if C-USA's 82% revenue drop on their latest deal is any indication, it very well could), demand for bowl games will shrink, and the Sun Belt will lose any incentive for schools like us and UTC to view it as a step up. We'd be consistently competitive in basketball, sure, but a move to FBS in the current climate where G5 teams are starting to feel the squeeze from TV companies that have given them the edge over high-end FCS programs comes with enormous risk. Salaries have to rise considerably on the football staff to meet market rates, and there are no guarantees those expenses will be offset. I'd much rather play it safe, see what happens over the next five years or so with the P5/G5 dynamic to see if it's sustainable or the P5 breaks away, build a competitive FCS program, and reevaluate. As for Chattanooga, they should start by not scheduling so many gimmes. Shorter and Presbyterian were their non-conference home games this year. You're a top 10 program and that's seriously the best you can do? Your fans aren't stupid. Get Jacksonville State or Central Arkansas on a home-and-home and promote those matchups. Playing non-DI schools and teams you can easily overpower won't draw fans, but a big game under the lights at Finley Stadium against another ranked opponent will. Small private schools and all, I'm pretty happy with the SoCon right now. It offers good football and competitive basketball in an environment where we have a reasonable chance at winning championships or making the FCS playoffs on a consistent basis. The iron isn't hot right now for realignment in this part of the country (nobody is looking to add), so I'd say let's see how we grow before we start thinking about another move. Also, pass on the OVC. The conference is not a competitive upgrade at all and contains the worst football team (APSU) and one of the worst overall athletic departments (SIUE) in Division I, plus our travel situation would get worse with trips to Illinois and Missouri. No thanks. That sounds like a spot on assessment of the situation for you guys and ETSU. I really think this whole thing is UTC in panic mode. The top 2 sports have both lost their coaches, top players, and a lot of momentum. Basketball has lost ALL momentum. If they think the Sun Belt is going to fire the casual fans up to attend football games, they are gravely mistaken. We're talking fans that NEVER attended a game during their amazing recent run of success. They think those fans will show up after hearing they joined the Sun Belt? Nope, not buying that. 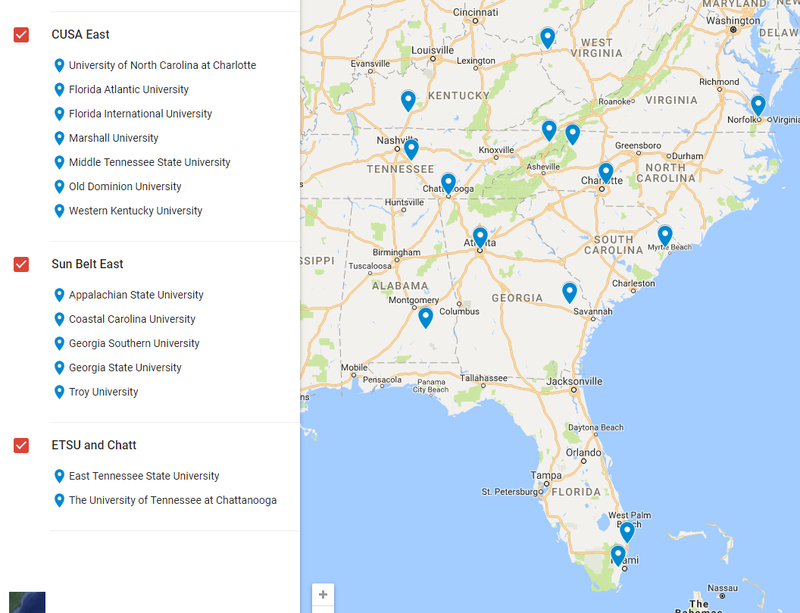 (05-08-2017 09:12 PM)Buccaneerlover Wrote: A Sun Belt conference where ETSU plays Appalachian, Ga. Southern, Chattanooga, Coastal Carolina, and Ga. State every year is going to pique interest. Those are regional schools that are old school rivalries, along with some nice name teams. This is what is appealing about the Sun Belt. If things get settled out where the teams above are all in the same division it becomes a real good situation for ETSU. To compete with the powers of that conference would require a 30-50% increase in the ETSU athletics budget. And here would be the footprint of a new conference if CUSA and Sun Belt ever decided to swap divisions. Or it would require selling non revenue sports completely down the road and focus solely on football and men's basketball, and still increase by around 5-10 million annually. And yes, I'd be fine with that for awhile. Eventually it would balance out. (05-23-2017 04:44 PM)Buccaneerlover Wrote: Or it would require selling non revenue sports completely down the road and focus solely on football and men's basketball, and still increase by around 5-10 million annually. What is your current athletic budget now?